When MillerCox Design partnered with the Saban Center seven years ago, it was a new center with an important message to send. The center’s goal was to produce an annual report aimed at increasing donations and getting it into the hands of some of the biggest donors in the country. 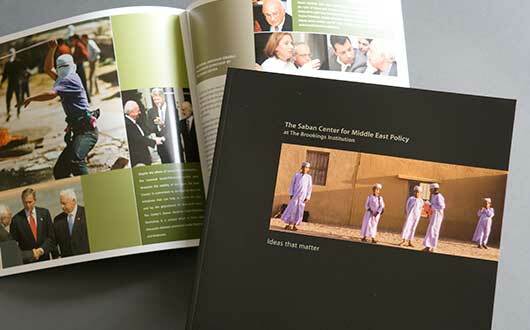 The report we designed had a dramatic layout and included compelling and disturbing imagery from the Middle East. MillerCox controlled costs by printing on a smaller press and using an economical paper, while still creating a strong visual impact. The investment in the brochure paid off, as the donations far outpaced the design and printing costs.